Plans to restore a controversial but internationally acclaimed piece of public art in County Durham are going on show. 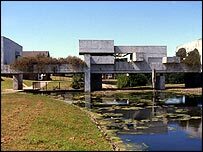 The Apollo Pavilion was created by abstract artist Victor Pasmore and completed in Peterlee in 1970. It was refused listed status by the government, and has been plagued by problems like vandalism and graffiti. The public can view ideas for its possible restoration at an exhibition at the Durham Light Infantry Museum. Pasmore, who died in 1988, produced experimental housing plans for Peterlee in the early 1960s and became involved in the design for the pavilion after the original architect withdrew. His flat-roofed housing was grouped in patterns with patio gardens, courtyards, parking and open areas. The pavilion grew from the need to focus on the central area where a small pond separated the road from pedestrian areas. Over time, the housing was altered and upgraded, leaving only the pavilion in its original form. The exhibition runs alongside "Spotlight on Victor Pasmore", which contains a selection of works form the Arts Council collection.